Shirts With Random Triangles: Happy Birthday Urban Meyer! 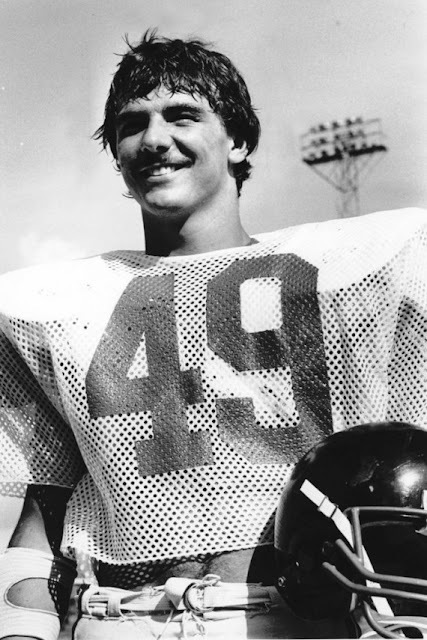 It's Urban Meyer's 49th birthday! What better way to embarrass celebrate the Ohio State head football coach's birthday than with a photo of Meyer back in his college football playing days at Cincinnati. He didn't get much playing time as a defensive back, but it lead him to where he is today - being accused of enabling Aaron Hernandez while at Florida. But I won't bring that up today. Of course the awesomeness if this photo is its retro glory. Greasy hair, pube mustache, navel-revealing mesh practice jersey, and all.